An American phenomena! Incorporating 240 pounds of Maine blueberries into a unique medium-bodied ale. Poured my portion into a nonic pint glass, the appearance was a ruddy semi-dark brown color with some sly blue hues to the edge of the glass. Finger’s worth of white foamy head dissipated at a nice pace. Sly lacing. The aroma centers around the blueberry with a sly sweet crust like a pie sliding in underneath. The flavor yields the same sort of fruity blueberry sweetness, subtle tartness from it. Sly sweet to tart blueberry aftertaste with finish. On the palate, this one sat about a light to medium on the body with a nice sessionability about it. Gentle smoothness coming from a low carbonation. Overall, nice refreshing blueberry ale, good for the Summer months, probably only have again then. A-Copper color. A bit surprised by the hue of this one. S-Initially didn't get much of a blueberry aroma. It doesn't smell artificially flavored which is nice. When I really pulled, I did get some blueberry and other fruit. The base of the beer is clearer. T-The most noticeable flavor was the malt. The blueberry is more muddled in with other fruity aspects. Without a chance to really pick this one a part, I think I missed the boat. M-Medium bodied. Medium carbonation. Faint blueberry aftertaste. O-I enjoyed the fact that this wasn't your standard artificial blueberry bomb like most. Aside from that, I didn't find much more that I enjoyed. Thanks to Chris for the extra! The beer pours a nice dark burgundy color, hints of ruby with touches of amber when held to the light, looks like blueberry juice for sure, a light slightly off white head rises to the top of the glass, almost a finger high but recedes almost immediately leaving a touch of lace behind. The aroma is of light tart blueberry but overwhelming rich grainy malt character with a touch of sweetness behind it. It's quite one dimensional, which isn't necessarily a bad thing when the focus is showcasing blueberry, but the fruit character is quite weak in reality and showcases more malt than I'd like, not the most inviting of beers on the nose. The flavor is a bit better, tart juicy blueberry greets the tongue nicely and lingers somewhat well, again caramel malt sneaks out and really dominates until the finish which has some nice blueberry skin flavors as it goes down. The body is very crisp and lively, a bit too carbonated for me, overly prickly in the mouth and a bit rough as it goes down. Verdict: Not a bad fruit beer but disappointing given my love of blueberries. The fruit never really shines here as the richer malts take control but all in all it was a pleasant beer to sip on. Poured into a wine glass, thanks to Miamilice for the trade. A: Pours a darker, reddish/brown color reminiscent of autumn. Small head that fades. S: Slight Apple notes with blueberry coming in on the end. T: Dry almost Cideresk. Light flavor with some blueberry notes. Lots of carbonation. O:Good, not great. Smell and taste are good but it falls apart on the mouthful. Medium amber with a little purple hue. No head. No lace. Blueberry, right? Not in the nose on this. Toasted malt, some caramel maybe. This one has just a kiss of fruit. Mostly toasted malt, some caramel, a little burnt sugar bitterness. Lightly bitter and malty in the finish. Overall, some blueberry beers are overdone, some are underdone. This one needs more fruit. The rest of the beer was good, but this one just misses for me. Poured from a 22oz bottle into a Pilsener glass. Thanks to my Dad for bringing this one back from the brewery. A: A pretty crystal clear, purplish-toned amber color. Aggressive pour leads to a 1 finger fizzy white head that disappears quickly. Leaves no lacing. S: Decent blueberry aroma with some bready malt and a faint touch of hops. Not overpowering, nor is it bad. T: Very nice, yet slight blueberry taste mixed with some yeasty funk and slight caramel touch from the malt. M: Light body, ample carbonation. No bitterness, not overly sweet either. O: Overall a nice, non-offensive blueberry beer. Would definitely have more if Portsmouth chose to distribute :). 22oz bottle purchased at the brewery last weekend. Poured into a Portsmouth tulip. A - Pours a reddish, purpleish blueberry hued amber color. There is some light haze and a finger of white foam that dies quickly to a thick collar. Streams of bubbles constantly rise from the bottom of the glass. S - Fruity although not distinctly blueberry in aroma. Some floral and earthy hop aromas over the top of some light bready malt. A bit of a red wine like aroma to round things out...also gives an impression of alcohol, although the level is low enough that this shouldn't truly be the case. T - Grainy malt at the base, dry and cereally - almost Cheerios-like. This is surrounded by some earthy and metallic flavors in the middle with some berrylike fruitiness, that is still difficult to precisely identify as blueberry. A light sweetness and some spices - cinnamon maybe. Blueberry is easier to identify as the beer warms up a bit, and the flavor almost becomes blueberry pie like as the malt and fruit combine together much more nicely than when chilled down more. M - Medium bodied with a strong carbonation that is fizzy. The malt base lingers into the aftertaste nicely as does the blueberry. D - Easy drinking beer. Good combination of flavors that work well together. I think I'd like this to have a bit lighter base to it, or maybe get a touch of lemon in here to bring out the blueberry a bit more in the flavor. Overall, very enjoyable summer seasonal. Pours a cloudy red with some particulates and a tight offwhite head which doesnt hold long but leaves some soapy lace on the glass. Scent is wild blueberries, bread, honey, graham cracker. Taste is blueberries of course. Natural tasting and not overpowering. 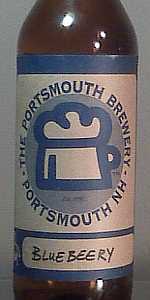 Lightly sweet with the wonderful dry breadcrust finish I often notice in Portsmouth's beers. Very light, crisp, clean hop bitterness lingers on the tongue. Saaz or noble hops? Lightly creamy mouthfeel with surprisingly light carbonation. Not my favorite among Portsmouth's offerings (fruit/veg beers are not really my thing) but a well crafted and delicious ale all the same. This was a really nice blueberry beer that was served on tap which my wife and I tried 08-19-2010 at the brewery. I have read a couple of the reviews for this but mostly for the bottle version. This is great on tap they even add a couple of blueberrys on the top of the pour (I know fruit in beer). It really adds to this nice refreshing beer. I recommed to anyone this as is crisp and refreshing. The beer has a nice aroma and the taste is above average the mouth feel is good but rated the drinkability high as really enjoyed drinking this one and would have again. Pours hazy, dark copper with a purple hue and a thin, white head. A whisp on the surface of the brew and a few dots of lacing throughout the glass. Aromatics are laced with a soft blueberry kiss, crisp malt, and underlying fruit. Not really full of blueberry essence, but it's there. Medium bodied with a slickish mouthfeel. Slightly syrupy with light carbonation. Ripe berries, sweet malt, and light caramel on the palate. The bitterness is low, and the beer is slightly sweet. Not sure if I could tell it was blueberries I was tasting unless I knew. Finishes with lingering fruit and sweet malt. Pretty dissapointing. The faint blueberry nose delivers even less on the palate. Better than some Blueberry ales, but I've come to expect more from Portsmouth. Hands down, my wife's favorite beer; nothing else comes close. This was her first Brewery visit back in 2008 and thank god she loved it. We've done about a dozen brewerys since. My rating is done through her eyes. For me, this brew was just your average pilsner but I like my brew hopped. They brewed a stonger blueberry this year but never got up there to try it and now they are out, damn. Just got back from visiting the Portsmouth Brewery last weekend and decided to grab a bomber of their Blueberry Ale to go. Really enjoyed the atmosphere of the brewpub and they had a nice offering of beers, plus some from their sister brewery, Smuttynose. The Blueberry Ale produces a small head with a vigorous pour, which dissipates into almost nothing, except for a small ring of foam around the top. Usually I would knock this, since I think a nice foamy head makes the beer look more appetizing, but when they serve it to you at the pub they float blueberries on top, so lack of foam allows you to see them and the overall presentation is well done. The color of the beer is a clear red/amber hue. Looks nice. The aroma is very malty, sweet and some fruit, which I'm guessing is blueberry. Overall, very malty. The flavor again is robust in its maltiness, not dark roasted malts, but more of medium roast that has a sweet flavor. Almost no hops are present, so malts really dominate. There is some fruit flavor as well, which does taste like blueberry, but if I didn't know this was a blueberry beer to begin with I don't know if I could have decided on the specific fruit flavor. The mouthfeel is just about right for this kind of beer. Not too thick or watery. Very smooth. Carbonation is on the lower side, but goes well with the smoothness. Overall, this is a highly drinkable ale and the flavor is fairly robust. Could easily have a couple of these at the brewery. However, the beer doesn't really stand out from other fruit beers I've had. So I wouldn't go out of my way to get it, but I would go out of my way to visit the brewpub. Had this on tap first at the brewery. They serve it with blueberries floating in the glass. Liked it enough to pick up a bottle and check out at home. Poured into the Portsmouth Brewery snifter, which by the way is one of the most voluminous snifters I have seen to date. Pours a blood orange body with nice head that dies like it's its business. Smells lightly malted and a little sour. I remember there being more blueberry presence, but even after cleaning my nose a few times (I don't even have a cold), I can only faintly detect it. That's pretty normal for blueberry beers. Tastes... mmm. Sweet. Mellow-malty and light but sharp carbonated. Bouquet of blueberries with each mouthful. It tastes very natural for an ale, and is extremely drinkable. No discernable after-hop presence, which might have overwhelmed the blueberry taste, but there is just a touch of bitterness to keep me interested. Smooth possibly due to sweetness and light-bodied. Easy to finish off a bottle. Overall, good for a blueberry beer. I'd pick this one up again.